Blurb: Avery Rivers is a country music sensation, selling records by the millions and playing to sold-out crowds. But behind that persona is Robert, a burned-out musician cracking under the pressure. He’s unable to write any new songs, and he wants out of the business – at least for a while. He changes his appearance and finds honest hard work in Jackson, Wyoming. Maybe getting to be a regular guy for a while will get him past his block. Hy Whitely was a championship bull rider until he watched his best friend thrown in the arena and decided the rodeo circuit was no longer the place for him. He wants to be plain old Zeke for a while, and when he returns to his family ranch, he bumps right into Robert – a one-night stand from his last rodeo appearance – who is now working there as a ranch hand. 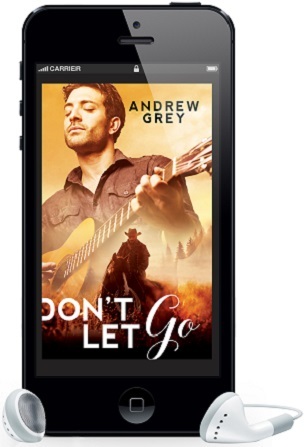 Review: Don’t Let Go by Andrew Grey has three things that I absolutely love. 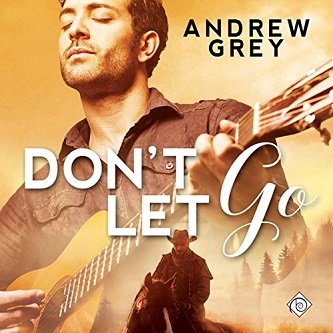 Firstly, a book written by Andrew Grey is instantly on my to be read pile, second there is cowboys (on the rodeo circuit at that) and thirdly, I’m a sucker for a country singer out for a bit of romance. This was a totally satisfying audio. The story was super sweet and the chemistry was on point, just as I expect from Andrew Grey. The last couple books I read of his had left me a little disappointed and so to me was a return to what I love about his writing. The audio narration was by Jeff Gelder, who I’ve heard narrate books in the past (and probably other Andrew Grey books too). I enjoyed the narration. He had provided a good voice for the two MCs and was good in conveying their emotions through words and tone. Overall, his style was rather laid back, which for the most part suited the backdrop of the story. The story starts with Robert, aka Avery Rivers, is a massive star in the country music world. He is at the end of a long and exhausting tour but is already dealing with the pressure for more tour dates as well as write songs and record his new album. The biggest problem is that the words and the music are just not coming, and he is dangerously close to burning out. And so ready to drop the Avery Rivers persona and be just Robert, at least for a little while. He wants nothing more than for the music to come back but he is already fighting the fear that they will never come back if he doesn’t take this break. So, Robert shaves his hair off and makes himself only contactable by phone and he hits the road. A one-night stand while attending a rodeo sends Robert to Jackson where he manages to find work on a ranch helping an older gent on his property. For Robert it’s a dream because he had grown up on a ranch until his parents lost it and were forced to leave the land. Hy Whitely is a star on the rodeo circuit. His actual name is Zeke and uses the stage name to maintain his privacy. He has an eventful tournament though, when his road buddy is seriously injured and sent to hospital, but not before he had a one-night stand that rocked his world. After speaking about home to Robert, who he had met a bar and after the events that culminated in Zeke winning the rodeo, he heads home to help his father on the ranch. In a lot of ways Robert and Zeke are two sides of the same coin and together they are everything that turns you to goo and believe in love. They are well matched together, I enjoyed the lack of angst and drama considering both men use stage names, not revealing their identities to each other on purpose for most of the story. is how to maintain a relationship when their jobs are not conducive to being together. Along the way I thought it was funny that Zeke’s father is the voice of reason here, although Zeke doesn’t get along with his father terribly well, the man is a rough and gruff country man and found him quite likable, particularly at the end. If you’re into cowboys and rodeos and a splash of celebrity this will suit you. Like me, I know the whole western/cowboy/ranch sub-genre is pretty damn popular in MM and so if this is your thing, go for it I’m sure you’ll enjoy it. Posted on March 26, 2019 March 26, 2019 by PrimePosted in Audiobook, Audiobook Review, Book Review, Dreamspinner Press, MM Book Review, MM Romance Book Review, ReviewsTagged Andrew Grey, Dreamspinner Press, Gay Audiobook, Gay Contemporary Romance, gay cowboys, GLBT Audiobook, GLBT Contemporary Romance, GLBT Cowboys, Jeff Gelder ~ Narrator, Prime's Reviews. Next Next post: Blue Umbrella Sky by Rick R. Reed Blog Tour, Excerpt & Giveaway!